A tremendous crowd of international media welcomed five of the world class fighters on the outstanding “SUPERFLY” professional boxing event set for Saturday, September 9 at the iconic StubHub Center in Carson, CA and televised live on HBO Boxing After Dark beginning at 10:15 p.m. ET/PT. 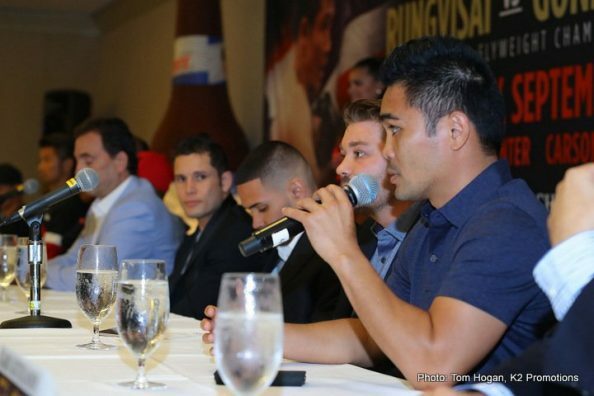 Among those in attendance on the dais were Four Division World Champion ROMAN “CHOCOLATITO” GONZALEZ, Former WBC Super Flyweight World Champion, CARLOS “PRINCIPE” CUADRAS, Two-Time Flyweight World Champion JUAN FRANCISCO “EL GALLO” ESTRADA, World Ranked Super Flyweight ANTONIO “CARITA” NIEVES and Four-Time World Champion BRIAN “THE HAWAIIAN PUNCH” VILORIA along with TOM LOEFFLER, Managing Director of K2 Promotions. 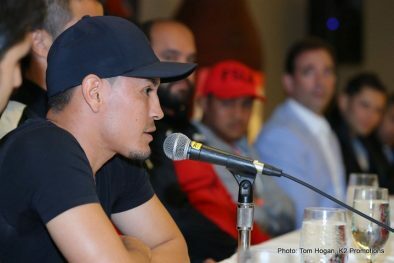 “Thanks to God, Mr. Honda, K2 Promotions and HBO for giving me the opportunity to fight again with Rungvisai. I come here with a lot of hope and hunger to take the world championship back to the people of Nicaragua. We’re going to work very hard and we’re going to be ready to come back. “I consider myself a real warrior but I can box and do a lot of things in the ring. I always have respect for my opponents. Carlos is one of the best and I have a great deal of respect for him. 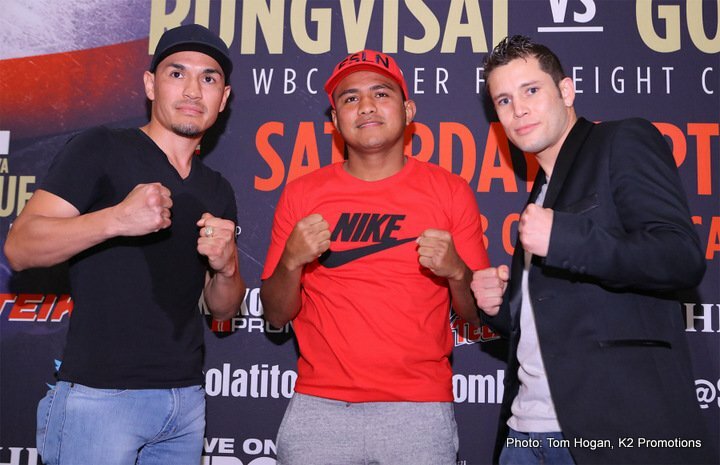 Televised live on HBO Boxing After Dark beginning at 10:15 p.m. ET/PT, “SUPERFLY” is headlined by the WBC Super Flyweight World Champion SRISAKET SOR RUNGVISAI, (42-4-1, 38 KO’s), of Si Sa Ket, Thailand, defending his title against former champion “ROMAN “CHOCOLATITO” GONZALEZ (46-1-0, 38 KO’s), of Managua, Nicaragua, in a rematch of their epic battle this past March. Co-featured on the outstanding “SUPERFLY” card is the highly anticipated United States debut of NAOYA “THE MONSTER” INOUE, (13-0-0, 11 KO’s) of Yokohama, Japan defending his WBO Super Flyweight Title against top contender ANTONIO “CARITA” NIEVES, (17-1-2, 9 KO’s) of Cleveland, Ohio. 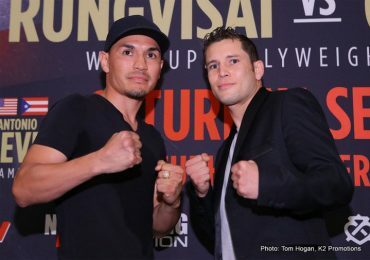 Opening the telecast, former WBC Super Flyweight World Champion CARLOS “PRINCIPE” CUADRAS, (36-1-1, 27 KO’s)) of Mexico City will battle fellow rival countrymen and former two-time flyweight world champion JUAN FRANCISCO “EL GALLO” ESTRADA, (35-2-0, 25 KO’s) of Sonora, Mexico in a 12-round WBC Super Flyweight Title Eliminator. Just added to the outstanding “SUPERFLY” event, four-time world champion in two divisions “THE HAWAIIAN PUNCH”, BRIAN VILORIA (37-5-0, 22 KO’s) will fight in an eight round super flyweight bout on the off-TV undercard. Remaining tickets for “SUPERFLY” can be purchased at AXS.com, by phone at 888-9-AXS-TIX (888-929-7849), and at StubHub Center Box Office (Monday through Friday from 10 a.m. PT to 6 p.m. PT). VIP Suites are available by calling 877-604-8777. For more information on group discounts or VIP packages, call 877-234-8425. Doors will open on the night of the event at 3:30 p.m. PT with the first bell at 4:00 p.m. PT. 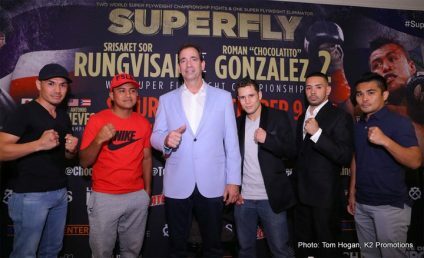 Advance tickets for “SUPERFLY”, the outstanding boxing tripleheader set for Saturday, September 9 at The StubHub Center in Carson, California, are moving very fast according to TOM LOEFFLER, Managing Director of K2 PROMOTIONS, promoter of the event. 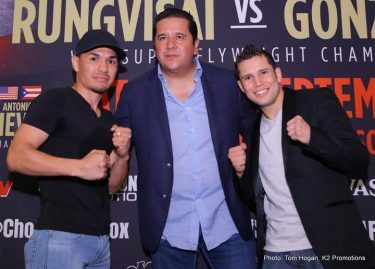 “The combination of the three world class fights in the super flyweight division with the country’s premier outdoor boxing venue that has played host to numerous legendary nights of boxing, has made this a must-see event for boxing fans, “said Loeffler. Tickets for “SUPERFLY” will go on sale Tomorrow, Friday, July 7 at 12:00 p.m. PT and are priced at $250, $150, $100, $60 and $30, plus applicable taxes, fees and services charges. Tickets can be purchased at AXS.com, by phone at 888-9-AXS-TIX (888-929-7849), and at StubHub Center Box Office (Monday through Friday from 10 a.m. PT to 6 p.m. PT). VIP Suites are available by calling 877-604-8777. For more information on group discounts or VIP packages, call 877-234-8425. Doors will open on the night of the event at 3:30 p.m. PT with the first bell at 4:00 p.m. PT. 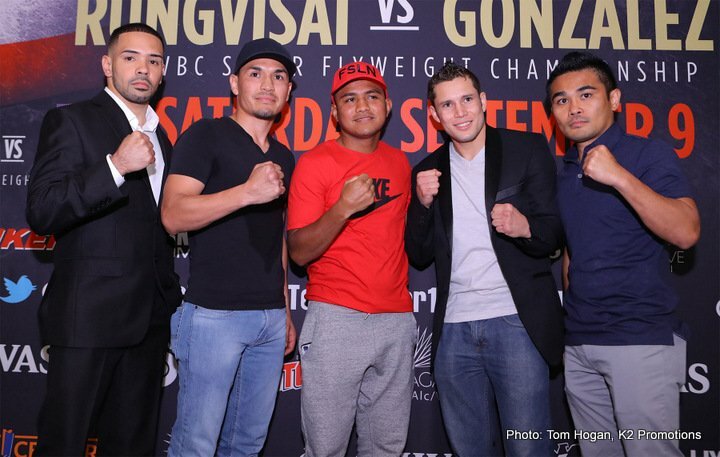 Televised live on HBO Boxing After Dark beginning at 10:15 p.m. ET/PT, “SUPERFLY” is headlined by the WBC Super Flyweight World Champion SRISAKET SOR RUNGVISAI, (43-4-1, 39 KO’s), of Si Sa Ket, Thailand, defending his title against former champion “ROMAN “CHOCOLATITO” GONZALEZ (46-1-0, 38 KO’s), of Managua, Nicaragua, in a rematch of their epic battle this past March. 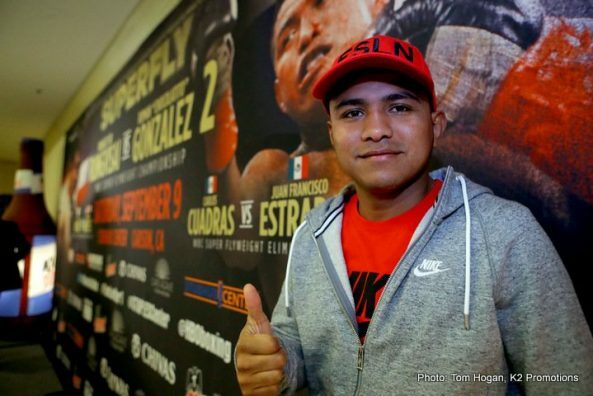 On March 18, 2017, ‘Chocolatito’, universally recognized at the time as The #1 Pound-for-Pound Fighter in the World and holder of the WBC Super Flyweight Title, battled Srisaket Sor Rungivisai in front of a massive crowd at ‘The Mecca of Boxing’, Madison Square Garden. Despite being dropped in the first round, the valiant ‘Chocolatito’ battled back in a brutal war that included a tremendous amount of hard-hitting from both combatants along with a number of head butts due to the aggressive styles of the orthodox champion and southpaw challenger. The World Boxing Council (WBC) ordered an immediate rematch so there would be no question who their champion would be. The 24-year-old Inoue is among the most popular fighters in Asia, having already made five defenses of his WBO Super Flyweight Title he earned following his second round knockout of Omar Narvaez on December 30, 2014 in Tokyo, Japan. Earning his nickname, “The Monster” from his heavy handed knockouts, Inoue is seeking to grow his fan base from the huge Asian community of U.S. based boxing fans. Inoue kicked off his 2017 campaign with a third round stoppage of Ricardo Rodriguez on May 21 in Tokyo, Japan. Fighting out of Cleveland, Ohio, Nieves will be looking to join the long history of world champions of Puerto Rican heritage. 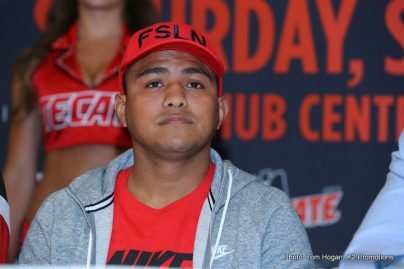 Undefeated through the first six years of his professional career, Nieves suffered his first loss very controversially, losing a 10-round split decision to Nikolai Potapov on March 10 in Detroit, Michigan. 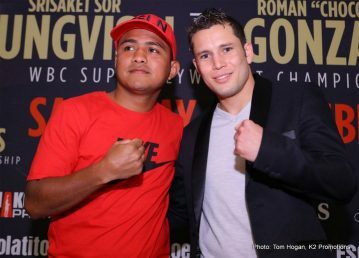 In a 2016 ‘Fight of the Year’ contender, former WBC Super Flyweight Champion Cuadras would lose for the first time in his eight-year career on September 10, 2016 by unanimous decision to Roman ‘Chocolatito’ Gonzalez. 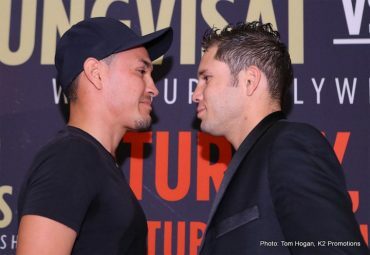 Fighting furiously over the course of the twelve epic rounds in front of a huge crowd at The Fabulous Forum, Cuadras would come up just short on the scorecards losing by unanimous decision. 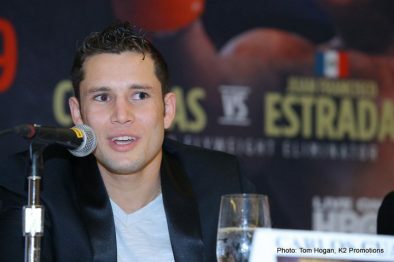 Most recently, Cuadras won a hard fought 10-round unanimous decision over fellow Mexican David Carmona on March 18, 2017 at Madison Square Garden in New York City. 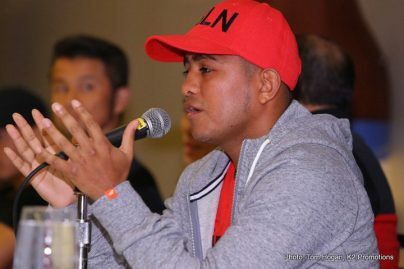 A former unified flyweight world champion, Estrada is best known for his action packed 12-round battle with Roman Gonzalez on November 17, 2012 in Los Angeles, losing a very close decision. 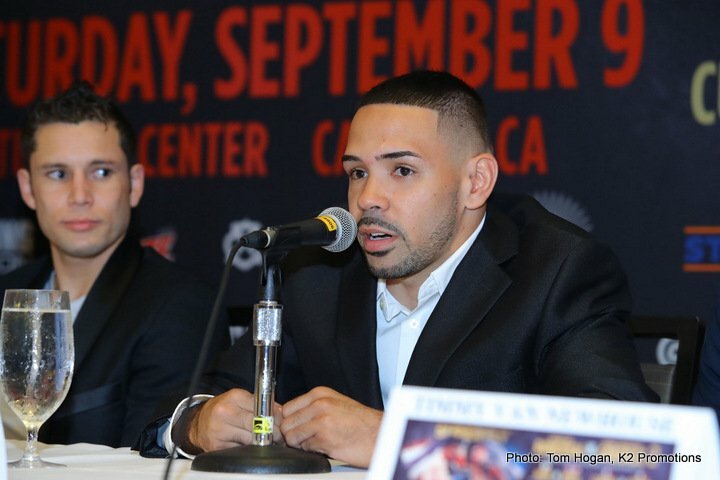 Estrada also holds wins over former world champions Brian Viloria, Giovani Segura and Hernan Marquez.